Monday November 5th 1883 We did the washing this morning though it was rainy and put some of the clothes up in the garret. I sewed all the afternoon and evening making aprons out of old stuff. Tuesday November 6th 1883 I was busy about the work most of the day. Mary washed out some calico things and ironed most of the things. 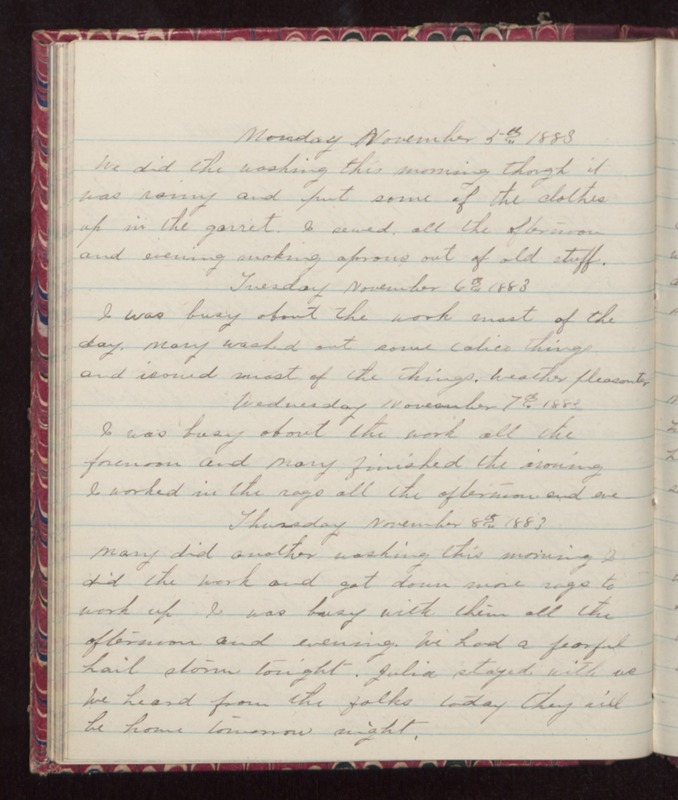 Weather pleasanter Wednesday November 7th 1883 I was busy about the work all the forenoon and Mary finished the ironing I worked in the rags all the afternoon and eve. Thursday November 8th 1883 Mary did another washing this morning I did the work and got down more rags to work up I was busy with them all the afternoon and evening. We had a fearful hail storm tonight. Julia stayed with us We heard from the folks today they will be home tomorrow night.